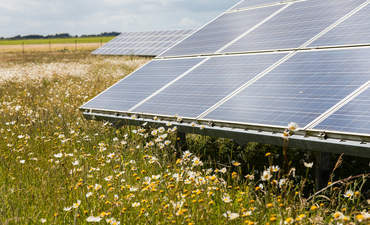 Pollinator habitat on solar sites is a common practice in Minnesota and Wisconsin, and is abundantly feasible wherever solar installations are replacing row crops. The practice simply uses a different seed mix — not turf grass — to create a low-growing and shade-tolerant flowering meadow. These flowering plants have many agricultural and ecological benefits. The U.N. Food and Agriculture Organization estimates that globally, 75 percent of food crops rely at least partially on pollination. Pollinator-friendly solar sites can bring pollinators into closer contact with food crops. Read more here. What is the Climate Solutions Caucus? 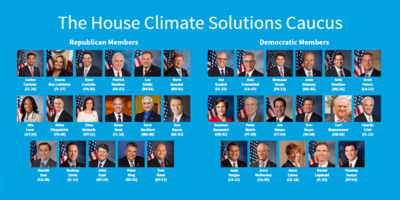 The Climate Solutions Caucus is a bipartisan group in the US House of Representatives which will explore policy options that address the impacts, causes, and challenges of our changing climate. The caucus was founded in February of 2016 by two south-Florida representatives Rep. Carlos Curbelo (R-FL) and Rep. Ted Deutch (D-FL) who will serve as co-chairs of the caucus. “The Caucus will serve as an organization to educate members on economically-viable options to reduce climate risk and protect our nation’s economy, security, infrastructure, agriculture, water supply and public safety,” according to documents filed with the Committee on House Administration. Membership will be kept even between Democrats and Republicans. This entry was posted in Nebraska / Midwest News, NewsBlog and tagged bipartisan action on climate change, businesses' renewable energy goals, Citizens Climate Lobby (CCL), climate change action, Climate Solutions Caucus, coal ash, coal ash disposal & potential environmental impacts, food and agriculture, Michigan's first green tariff, Nebraskans for Solar, pollinator-friendly solar sites, renewable energy, solar energy, sustainable businesses, Tesla roof on May 15, 2017 by Helen Deffenbacher. Graham Christensen grew up immersed in values of public service, integrity, education and all the responsibilities that come from work on a family farm. His family farm, established in 1867 under the Homestead Act, operates on about 800 acres in his hometown of Oakland, just north of Fremont. Christensen also grew up in the era of the 1980s farm crisis, where he learned the value of hard work. He came to understand that when a person runs up against difficult times, maintaining the ability to speak out for what you believe imparts great purpose and impact on individuals’ own circumstances, as well as on the surrounding community. Read more here. Photo: Courtesy GC Resolve. 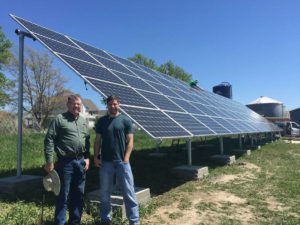 Graham Christensen, founder and owner of GC Resolve, is working on a solar project for a Nebraska family farm. This entry was posted in Nebraska / Midwest News, NewsBlog and tagged farm energy, Fremont Tribune, GC Resolve, Graham Christensen, Nebraska Farmers Union, Nebraskans for Solar, solar energy, Sustainable Energy, wind energy on June 18, 2016 by Helen Deffenbacher. Engineers may be able to maximize solar energy to build cheaper and more efficient solar panels — with the help of the Cabbage White butterfly, scientifically known as Pieris rapae. 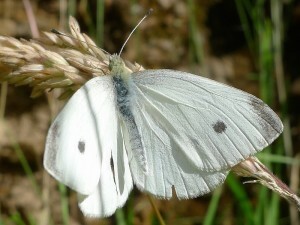 The Cabbage White is a small-to medium species of butterfly that can be seen fluttering about in Europe, Asia and North America. More noteably, the butterfly has a unique posture, which has provided a model for techniques that generate photovoltaic (PV) energy, converting light into power. This entry was posted in NewsBlog and tagged biomimicry, Cabbage White Butterfly, Jill Arce, Nebraskans for Solar, photovoltaic energy, solar energy, solar panels’ efficiency, Tech Times on August 3, 2015 by Helen Deffenbacher. It’s a homeowner’s dream: Install a solar or wind energy system, use the power you need and then sell the rest to your local utility. Despite the up-front cost of installing equipment, more homeowners and businesses are looking into making that dream a reality. Others already have. The city of Lincoln, for example, has installed a $48,000 solar energy system at its police substation at 27th and Holdrege streets, and the Unitarian Church of Lincoln at 63rd and A is adding a geothermal and solar energy system as part of a $2.4 million renovation and expansion project . . .
LES staff will discuss proposed changes to its rate structure for solar and other renewable energy projects on March 5, beginning at 6 p.m. at the Center for People in Need, 3901 N. 27th St., Unit 1. This entry was posted in NewsBlog and tagged Lincoln Electric Systems (LES), renewable energy, solar energy, solar energy in Nebraska on February 27, 2014 by Helen Deffenbacher.